Astrobiology is a new interdisciplinary science that seeks to understand the origin, evolution, distribution, and future of life in the universe. As a fundamental requirement of living systems, water holds a special place in the conceptual framework of astrobiology. All of life's processes are carried out in the presence of liquid water, and on this basis it may be regarded as a key indicator for potential habitability. The importance of liquid water as an organizing principle in the exploration for extraterrestrial life often is articulated in the simple expression "follow the water." What is it about water that justifies its central role in the search for extraterrestrial life? Most of water's unique properties (e.g., its excellent solvent properties, broad temperature range over which it remains liquid, high heat capacity, and surface tension) are rooted in the ability of water molecules to form hydrogen bonds with each other. In addition, on freezing, there is a slight expansion of hydrogen bond angles that produces a solid phase (ice) of lower density than the liquid phase. This uncommon property results in waterbodies that freeze from the top downward, an important factor for sustaining habitability in polar and other cold climates. Clearly, a knowledge of the past and present distribution of water in the solar system is regarded as crucial for evaluating the potential of other planets (or their moons) to develop and sustain life. Water also holds central importance in the human exploration of the solar system, being essential for the colonization of other planets, such as Mars. Throughout Earth's history, water has played a central role in the global cycles that link the solid Earth and the atmosphere. Interactions between crustal rocks and water sustain a broad range of processes that collectively meet most of the important energy and resource requirements of living systems. Such interactions ultimately determine the overall habitability of a planet, thus setting the stage for life's origin and ensuring its persistence over geologic timescales. The hydrologic cycle (the cycling of water between the atmosphere and oceans) drives a vast transport system that constantly redistributes materials and energy within the Earth's crust. Flowing water and ice transport rock fragments and associated weathering products from source areas to basins of deposition. Streams and groundwater (inclusive of hydrothermal systems) dissolve, transport, and concentrate chemical compounds required by organisms. Giant meteorite impacts billions of years ago would have caused setbacks in early Earth's ability to develop a stable biosphere. Yet once these impacts lessened, water and organic materials needed for living systems could have been retained. Most of the important materials for life on Earth (e.g., chemical nutrients) could have been brought in by comets and other icy objects. Sediments and the dissolved materials formed during weathering processes ultimately reach the ocean basins , where they accumulate as dissolved salts or seafloor sediments. Over the long term, even the dissolved load of streams eventually precipitate out of solution as secondary minerals (such as sedimentary cements) and chemical sediments (such as evaporites ). The deposits so formed often preserve signals for environmental change on Earth along with a fossil record of life's evolution. Over longer spans of time, cycling of the crust by the subduction of lithospheric plates and melting of sediment-covered seafloor and entrapped sea water produce magmas (molten rock materials). The water dissolved in these magmas actually lowers their density and crystallization temperature, thus promoting their buoyant rise back to the surface, where they drive volcanic activity. Over geologic timescales, volcanic outgassing of the Earth's interior regulates atmospheric composition and evolution. The Earth's close orbital distance from the Sun ensures a vast supply of solar energy that is utilized by photosynthetically based surface ecosystems. However, the energy output of the Sun was probably much lower (30 percent less than present luminosity) at the beginning of solar system history. Surface features of Mars suggest ancient activity of liquid water, and groundwater may currently exist deep in the subsurface. Scientists plan further explorations for evidence of past and present water, and perhaps Martian life. clear compositional differentiation of the Earth's habitable surface environments into two broad habitats: the continental land masses and the ocean basins. Around the same time, oxygenic photosynthesis emerged as a major biological innovation, taking advantage of the abundant energy available from the Sun. Oxygen production through photosynthesis eventually outstripped volcanic and weathering controls on atmospheric composition, producing an oxidizing surface environment. By approximately 600 million years ago, the buildup of oxygen in the atmosphere culminated in the appearance of large, multicellular life forms. This new level of organization in the biosphere enhanced global biodiversity , leading in stepwise fashion to the emergence of terrestrial (land-based) faunas and eventually to intelligent life characterized by self-awareness and advanced cultural, social, and technological civilizations. Given the terrestrial experience of humans, it is easy to understand why the search for water in all its forms, past or present, has emerged as the primary theme for exploration of the solar system. For example, over the next decade, scientific efforts to explore for water on Mars will create a context for assessing planetary habitability and the potential for Mars having developed life at some time in its history. Presently, the surface of Mars is properly regarded as a radiation-rich frozen desert that is hostile to life. Within about 1 billion years of its origin, Mars appears to have lost most of its atmosphere and, with that, the potential for sustaining liquid water environments at the surface. Interestingly, this early loss of the atmosphere appears to have been the result of the absence of a plate tectonic cycle on Mars. Yet Mars has not always been a dry, hostile place. 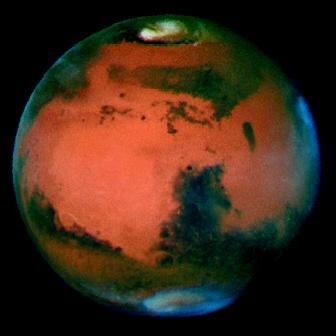 Exploration efforts in the late twentieth century revealed that prior to the loss of its atmosphere, Mars probably was much more Earth-like. The ancient southern highlands of Mars harbor a wide variety of water-carved landforms and layered sedimentary deposits of likely aqueous origin. The broad temporal distribution of these features suggests that even though the surface of Mars has been dry for most of the planet's history, liquid water has been present from time to time, providing brief intervals of surface habitability. Loss of the Martian atmosphere would have spelled doom for any surface life existing at the time. However, if Martian life forms colonized surface environments during earlier wet periods, they are quite likely to have left behind a fossil record. The search for this fossil record is in many ways the focus of the current Mars exploration program. The possibility of living Martian life-forms is one facet of ongoing research. On Earth, scientists have discovered that life occupies an incredible range of environmental extremes, including the deep subsurface, where it utilizes chemical energy instead of sunlight. Models suggest that liquid water (perhaps saline) environments could still exist today in the deep subsurface of Mars, along with energy-containing compounds such as methane, which could sustain chemically based life. The argument for subsurface habitability is strengthened by the existence of ancient out-flood channels, believed to have been formed by catastrophic releases of subsurface water in the past. These landforms provide direct evidence that a groundwater system once existed. But what about today? Scientists recently discovered what appear to be water-carved gullies on the steep slopes and high latitudes of Mars. Despite the constant subfreezing temperatures at those latitudes, water, in the form of subsurface hydrothermal brines , may have risen from deep crustal sources along faults , flowing briefly over the surface and carving the channels. The origin of these seep features remains controversial, but the hydrologic interpretation is consistent with a variety of other types of evidence that suggest the presence of a subsurface groundwater system. Further investigation of these features is warranted. If a subsurface groundwater system does exist on Mars, such environments may have provided stable habitats for life over the entire history of the planet. In 2002, the gamma-ray spectrometer onboard NASA's Odyssey orbiter discovered extensive water present as ground ice in surface soils over extensive regions of Mars at high latitudes. This has strengthened the case for an abundance of subsurface crustal water on Mars. In exploring for Martian groundwater, the practical problem faced by NASA (National Aeronautics and Space Administration) is accessibility. Accessing and sampling sources of subsurface Martian water (and potentially life) will require the development of precision landing systems capable of safely landing on steep slopes where potential seep sites are located, and/or long-ranging rovers capable of traveling to prospective groundwater sites (such as seeps) from safe landing sites located at a distance of perhaps tens of kilometers. Next, scientists will need to drill to depths of tens to hundreds of meters from small robotic platforms, a capability they presently lack. Although the previously mentioned technological capabilities have all been identified as long-term goals of NASA's Mars exploration program, scientists presently lack the technologies needed to access subsurface water on Mars with robotic platforms. As a result, some have suggested that drilling for Martian groundwater may require a human presence, something that is beyond the scope of the present Mars program. The earliest human missions to Mars, if they can be safely carried out, are unlikely to occur prior to 2025. SEE ALSO Comets and Meteorites, Water in ; Earth: The Water Planet ; Fresh Water, Physics and Chemistry of ; Life in Extreme Water Environments ; Mars, Water on ; Solar System, Water in the ; Volcanoes and Water . Carr, M. H. Water on Mars. London, U.K.: Oxford University Press, 1996. Chang, S. "The Planetary Setting of Prebiotic Evolution." In Early Life on Earth, ed. S. Bengston. New York: Columbia University Press, 1994. Klein, H. P. "The Search for Life on Mars: What We Learned from Viking." Journal of Geophysical Research. 103 (1998):28463–28466. Malin, M. C., and K. S. Edgett. "Evidence for Recent Groundwater Seepage and Surface Runoff on Mars." Science 288 (2000):2330–2335. LIFE IN A MARTIAN METEORITE? About 20 percent of the magnetites found in a 4.6-million-year-old Martian meteorite named ALH84001 resemble intracellular magnetites formed by some species of terrestrial bacteria. (Magnetite is a naturally magnetic mineral common in basalt.) 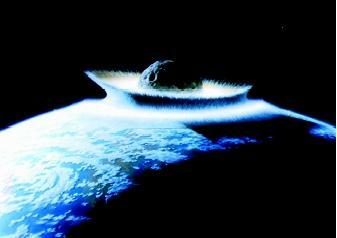 Whether the meteoritic magnetites are a reliable indicator of life was under scientific scrutiny as of 2002.